Nearly a decade after the September 11 attacks, Osama bin Laden is dead and the United States says it has his body. A U.S. military action conducted in Pakistan resulted in the death of bin Laden, President Barack Obama said in a special address to the nation Sunday night. “Justice has been done,” the President said in an announcement from the White House. 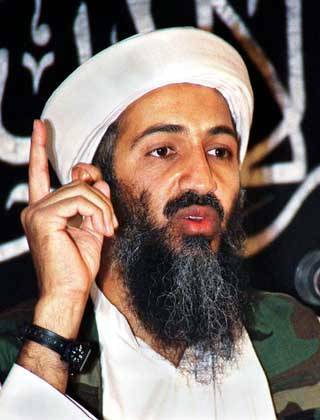 The death of bin Laden is the culmination of a decade long manhunt for the terrorist leader that was the mastermind behind the Sept. 11, 2001 attacks on America that left 3,000 people dead and changed national security. President Obama now has a huge price on his head. This also leaves him open to threats from domestic threats from U.S. political enemies who may try to strike while blaming it on terrorists avenging bin Laden. Let’s pray for the safety of President Obama and his family. We even gave Nazis trials. If you want to mislead an international enemy, use the US media … get it! Do you think Osama bin Laden and his aids were not monitoring US media!!!! Lying about killing bin laden and then claiming to bury him at sea is about as hair brained as it gets, talk about desperate and just plain idiotic. I actually thought he really had been killed until I heard about the rather usual (not) Muslim burial. I haven’t believed that 911 happened like they tell us it did either. Go ahead and give me the raspberries, suckers. On the contrary, Cindy, you are spot on! Is This What Justice Looks Like? WOW so many comments and opinions and Democrat vs. Republican fights. All that aside, I’m real happy about this and Santa Claus and the Easter Bunny are over here right now and we are partying it up! WAKE UP America.. Someday, some of you are going to look back on some of your comments and have a good long laugh at how seriously you took yourself when what you were commenting on what you will later find is not reality. Nah, you guys have it all wrong. Obama didn’t run this operation any more than Bush ran the WMD investigation in Iraq. These guys are politicians. Nobodies frankly until they get elected. Then all of a sudden they are highly trained military personnel and military strategists? Please. I don’t think so. Obama never held a real job until he got elected— if you can call that a real job. Bush was a PR guy for a baseball team—ya that’s some great military training they have. Obama’s involvement in this operation consisted of saying “ok, go do it” same as Bush’s involvement in Iraq. To give these Presidents all the credit —-well, I guess it goes with the territory but in reality these old men politicians with no military training whatsoever do nothing more than give their scores of consultants a go ahead nod. Bush DID have some military training, as if that makes any difference. As far as President Obama saying “ok, go do it”, it was HIS decision alone to make as Commander in Chief. He had advice as to what could happen if bin Laden wasn’t there and how that would have been a very difficult situation to be in, staging a raid on a private residence in town full of retired military personal a thousand feet from the military academy, versus sending in drones to fire a couple of missiles at the compound and not being sure if bin Laden was there and losing all of the intelligence that was captured during the raid. Belittle President Obama all you want about “just making the decision” but that was his job, and his job alone. If this raid had gone badly the conservatives would have been screaming about his incompetence and demanding some sort of justice, but instead the raid went down extremely well. I do not cheer the fact that the seals killed the three men and the one woman who was apparently used as a human shield; I do not cheer that bin Laden was killed, but I do appreciate that the Seals did the job they trained for, that none of them were harmed and that they recovered some potentially valuable intelligence, and that the decision to go ahead with that raid was carefully deliberated by our President and that he made the correct decision. The president did have a lot of say regarding how this went down. He could have used what probably would have been a Bush tact to just bomb the place. But we know by know that Obama is very thoughtful and as you said we now have all kinds of info that we would have lost if they bombed the place. Also any employer is as good as his weakest link. Obama knew who to have working for him because he’s a smart thinking man and he surrounded himself with brilliant people. This is reminiscent of the time that the Seals went in and rescued the capt. from the Pirates. It was Obama that gave the order. He led that mission with brilliance. You’re right, it’s too bad that there were casualties but it could have been much much worse. Like the pirate issue, the operation was as close to perfect in every way possible as it gets. I find it EXTREMELY ironic that this comment thread stemmed off from the original comment I made… again, this is not reality, you are being played, wake up. Thank you Mr. President, the most successful and capable and wise Commander in Chief the U.S. has had in at least the past 50 years. Just imagine how much more he could do for his nation and the world if there weren’t so many foolish and malicious Americans continually trying to bring him down. Few people seem to appreciate how much courage Obama has needed to accomplish all that he has accomplished in the face of so many challenges and deadly threats. American’s clearly did the right thing in electing him President. bin laden was buried at sea.. the arabian sea. though it’s not muslim custom to bury at sea , he was buried within the 24hrs after death, which is muslim custom or law. the seals built a duplicate compound to train for the mission, so they may have known about him being there for 8 months. but have spent that time doing further intel and training. there will be photos released of the body and video of the burial at sea. i believe he’s dead but i’m sure many will claim it’s a fraud , to each there own i guess. I believe, and the facts are showing, that Barack Obama is working to make our government more honest and open. I was absolutely stunned when I got the news! I was at Geoffrey’s in Malibu celebrating my birthday when I got the message on my cell phone! It’s the BEST birthday gift I could have received! The diners at the tables surrounding ours broke into applause when we shared the news with them! It was a brilliant well thought out plan. Obama has assembled a bunch of good thinkers that like him are brilliant strategists. The more I hear about this more proud that I am to have such a smart administration. Burial at sea was the only smart alternative, nothing else would have worked, I’m sure that they even had that planned out just as I’m sure that they made sure to have the DNA tech there as to analyze Bin Laden’s DNA in a timely matter. There are so many different angles coming out on this. The prior prez and admin could never have carried out an operation like this. The Navy Seals have always been up to this daring task, it just took a strong smart leader to guild them. Why didn’t Bush follow his intel when they said “Bin Ladin determined to strike in the US” on August 6, 2001? Probably for the same reason that he DID follow his “bogus” intel about the WMD’s. “W” is going to rot in hell along with LBJ. his intel was a stovepipe from the pentagon , see “office of special plans pentagon“, see who resigned when this office was set up and why and now later decide if the retiree was correct. What do Osama and Obama have in common? They both have friends that have bombed the Pentagon. I’m more inclined to replace the name Obama with George W Bush, and the name Osama with “some of the 2001 President’s men” but some people will blame everything that occured while “W” was in office on Obama as if that even makes any sense. I don’t believe I’ve seen concrete believable intelligence that Osama knew anyone on the pentagon ‘crew’ personally, I think he knew about the operation but was not the master planner mind that would be the waterbored Khalid, but pretty good joke anyway. What are you talking about? Who does Obama know that has done that? Bill Ayers, Weather Underground, 1972 bombing of the pentagon. Obama was eleven years old in 72. What do you have against Bill Ayers. If he really did help President Obama writehis book and get elected, we should be THANKING HIM for it. Can you imagine the world of hurt we would all be in if McCain and Palin were running this ship? You know there are some guys my age, they are walking around enjoying their grandkids here and Asia who would otherwise be dead if Bill Ayers and others had not started the anti war movement. The pentagon was repaired,the nation learned something Bill Ayers is contributing and we all are moving on. If you’re referring to Bill Ayers (who NEVER personally bombed the Pentagon), I say: So What? Mr. Ayers is a respected university professor who has LOTS of friends and is contributing positively to our society. If he in any way helped Barack Obama to become President of the U.S., or end the Vietnam war, then we should most certainly be thanking him for those efforts.